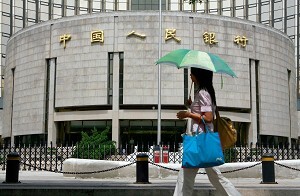 Under the pressure of inflation, the People's Bank of China (PBC) announced that it would raise the deposit and loan rates for the Renminbi (RMB) by 0.27 percent on September 14. Starting on September 15, the one-year deposit rate was increased from 3.6 percent to 3.87 percent. Moreover, the one-year loan rate was increased from 7.02 percent to 7.29 percent. Other types of deposit and loan rates were also increased accordingly. This is the fifth time the PBC has raised the interest rate this year. In its announcement, the PBC stated that the interest rate increase was to strengthen currency and credit regulation and control, create an increase in investment, and stabilize inflation. In addition to raising the interest rate, the PBC has already increased the RMB savings reserve rate of financial institutions seven times this year, in order to strengthen the management of bank system fluidity and keep currency credit from increasing too rapidly. Some experts have pointed out that increasing the interest rate and the bank savings reserve rate have become China's commonly used methods to restrain inflation and keep currency credit from increasing too rapidly. Throughout this year, the stock market and real estate prices have continued to rise in China. The Consumer Price Index (CPI) in August increased by 6.5 percent, setting a new ten-year high. People are worried that the overheated economy in China will bring further negative impacts such as a soft economy. Because of the rise of the CPI in August, international securities traders expect that the PBC will increase the interest rate again to restrain the economy from overheating.